There had been no 25” television in the B&O range since the LX 5500 was withdrawn, and the MX range had not radically changed its appearance for 14 years. These were the ideal conditions for the introduction of a completely new model, the BeoVision 1. Text copyright © Beocentral. Unauthorised reproduction prohibited. This new set was certainly radical in appearance, looking something like a smaller and tidier Beovision AV 9000. The concept was clear: a simple, stand-alone television offering good quality performance. Unlike the MX range, there were only minimal connections, so, for example, extra loudspeakers could not be connected. This was not a limitation in practice because a pair of excellent active loudspeakers – considerably larger than those of the MX 7000 - were built into the set. A connection for a rotating base was also unnecessary, since this was built in as well. A variety of different stands could be fitted, including wall brackets, a table base and tall or short floor stands. Text copyright © Beocentral. Unauthorised reproduction prohibited. If there was a disappointing aspect of the BeoVision 1, it was that having standardised their entire range on the Beo 4 terminal, B&O released a new terminal: the Beo 1, especially for the BeoVision 1. While they were compatible, this nevertheless complicated things needlessly. The new Beo 1 terminal was designed to be simple, but using it could be frustrating. One wonders who decided that a remote control with no number keys would be suitable for a television equipped with teletext! Those with other B&O equipment could use their Beo 4 or Beolink 1000 terminals instead. In fact those who ordered their sets early benefited from the Beo 4 terminal, as due to delays in producing the Beo 1, the first BeoVision 1s were supplied with the Beo 4 instead. Text copyright © Beocentral. Unauthorised reproduction prohibited. In addition to a very comprehensive on-screen menu system, there was also a red LED matrix display below the screen. This was essential in order to make the very basic Beo 1 usable, but it also added visual interest. To avoid being distracting to the viewer, the display disappeared after a few seconds if it was not used. A interesting aspect of the display was that if a numerical function was called up (e.g. the volume setting), on changing the value the numbers appeared to scroll around vertically, like those of a mechanical tape counter. It seems strange that the designers should try to make an electronic display appear to be mechanical, compare this with the tone and treble displays of the Beomaster 1900 23 years before, which appeared to be electronic but were in fact patterned clear plastic in front of a light bulb. Text copyright © Beocentral. Unauthorised reproduction prohibited. Inside, BeoVision 1 remained conventional. The tube was the 25” version of the Philips 45AX, a development of that used in the LX 5500. The chassis made extensive use of surface mounted components throughout, and could be repaired using a “service exchange” scheme, whereby the dealer was supplied with a suitcase containing a replacement chassis. This could be fitted quickly in the owner’s home, and the defective chassis returned to the factory in the case. The computer memory chips were mounted on a separate sub panel which remained with the set, so when a new chassis was fitted it was not necessary to re-program all the settings. Text copyright © Beocentral. Unauthorised reproduction prohibited. 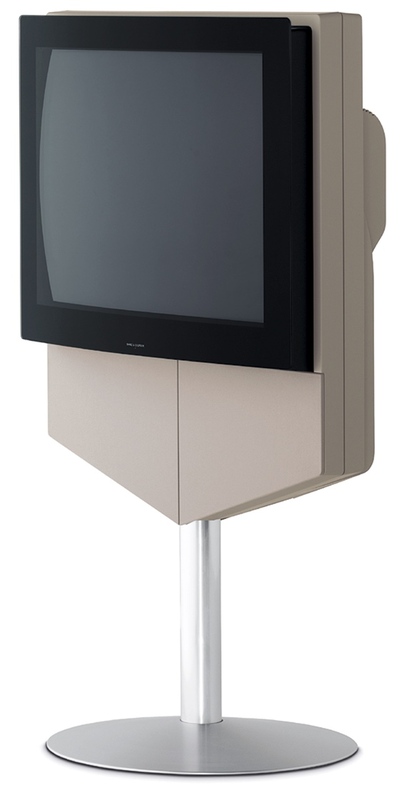 In 2001, an additional model was added to the BeoVision 1 range that included Master Control Link facilities—the BeoVision 1 LS. Text copyright © Beocentral. Unauthorised reproduction prohibited.